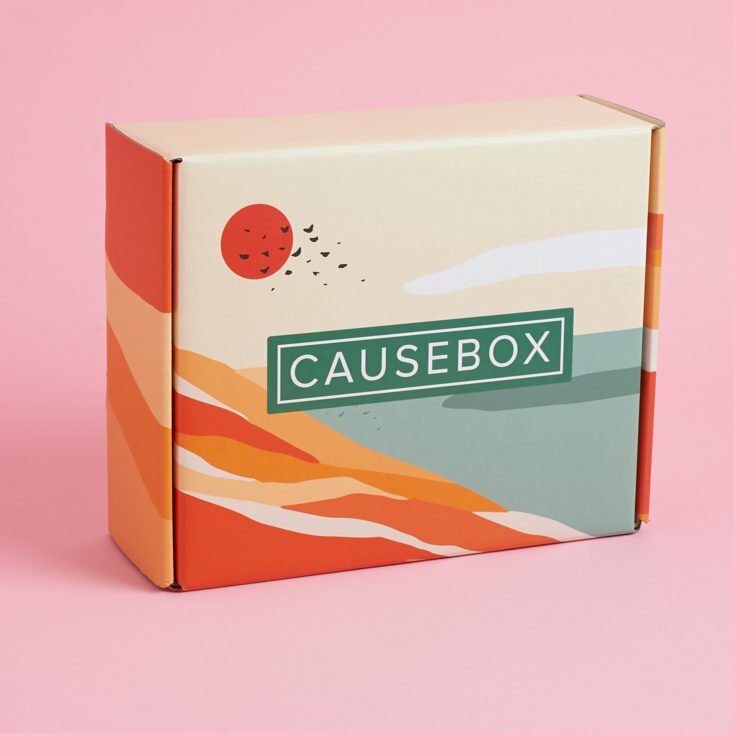 This summer’s edition of Causebox sold out so fast that they made a second summer box! This one features some of the same products as the first box, plus favorites from past boxes and more. As of publication, it is still available for purchase! They get in. DEPTH! I love it. It makes each item feel special. Plus it tells me why these aren’t just items I could find at any ol’ store. Who says you have to go on vacation to send a postcard? This would make a nice summer greeting for an out of town friend. This charming piece of jewelry is so versatile, I almost don’t feel quite right to call it a necklace. Depending on how you wrap it (and where), it can be a headband, a bracelet, a necklace, a bolo tie, a body chain, and anklet… whatever your heart desires! The delicate texture of the chain actually holds onto itself pretty well, so that things felt secure after looping it around a few times. I couldn’t find this design online, so I’d imagine this is a more unique, harder-to-find piece. I also LOVED reading about the socially and environmentally minded entrepreneur behind this brand in the booklet. There was a set of Karuna antioxidant masks in the first summer box, and I really liked them. This hydrating blend contains soybean and hyaluronic acid to give your skin a surge of moisture. The lightweight mask was doused in a healthy amount of watery serum—I found myself rubbing a lot of drippy excess into my neck and hands. It doesn’t have a strong scent, which I like. Some masks feel almost totally dry by the end of the 10-20 minutes, but this one was still pretty damp. The remaining serum felt a little sticky for a while after I took the mask off, but my skin was definitely plump and soft beneath! This reed diffuser smells like eucalyptus, sea salt air, lime, white lavender, sage, redwood, fir, and palo santo. The resulting fragrance is a little bit like an earthy white tea scent. It’s very beachy. I like the amber bottle and the old-timey label. It’s a cute addition to a shelf, as well as a nice fragrance to have drifting through my home. Argan oil is such a blessing for everything from the dry ends of my hair to my needy summer skin. According to the Scentuals website, this argan oil is “100% pure, virgin, cold-pressed, certified organic, fair trade and of the highest grade.” It absorbs beautifully and feels light as a feather in my hand. This exclusive kimono design was made just for Causebox subscribers! You’ll either get this sage green version of the ivory one we’ll be showing off in a second. I love wrapping this around myself first thing in the morning as I putz around my apartment in my PJs, but I think it’d also look nice as a third piece in my normal outfit (especially on those days when I want something cute and unique in my look, but it’s not quite cool enough to wear a full-on jacket). Verdict: I really loved the first summer box, but if you missed it, I highly recommend this one! It’s full of self-care picks that feel just right for lounging on vacation (or the air-conditioned comfort of your own living room). It’s on the higher end of what I’d spend on a box that’s purely a treat yourself kind of thing, but because all of the products come from such awesome, cause-fuelled brands, the $55.00 price point feels fair. Value Breakdown: This box cost $54.95. The items I could find online have a total retail value of $146.58, with 3 items (including the kimono, which is a bigger item in the box) to spare. Via the box cost, the average price paid for each of the 8 items would be $6.87. What do you think of the Summer Box #2 from CAUSEBOX? What’s your favorite item? I finally received my Summer box 2 today, minus the kimono, which is supposed to be “expedited” in the next 7-10 days. The lid of the argan oil bottle was loose and leaked on everything in the box. All I have is a greasy mess. I sent an email to customer service about it. Not sure what they will do. I will say that for the price of the box, it was worth it. Not sure if I will continue the subscription, though. Update: Customer service promptly replied to my email and is sending me another Summer 2 box due to the leaking product in the first one I received. A+ for customer service! Do they ever put leftover boxes on sale? I’m still on the fence about getting this second box. I’d like a second towel, and the kimono is nice, especially the green…but would I ever wear it?? It’s a good box for sure. Do not buy!!! I purchased mine almost 8 weeks ago and still haven’t received tracking info. on Facebook they keep saying that my causebox was shipped out and I haven’t even received tracking information for it so they’re straight up lying on their social media. I finally requested a refund after the third time I had to contact CS about my box not shipping when they said it would. They kept promising to “expedite” it by certain dates, then not following through. Take the money and put it toward a nice fall box, which you might just receive before you ever would have gotten this “summer” box. I ordered a summer box no. 2 A’s my first box order but wasn’t able to pick the color of the kimono, were you?! I still have not gotten mine and no email that it is on it’s way. My expected shipping date is the END of August so if your thinking of ordering it you won’t get it for THIS summer ! They should have shipped without the kimonos and sent them latter. They don’t even respond on there Facebook wall to any negative comments just the Happy costumer ones. This is my first box with them not at all interested in a another. If you speak to CS, they will issue a refund. After the 4th change in my expected ship date, I decided I was done. Took that money and put it toward the Popsugar Fall Box instead. That way I’ll get nice fall accessories in time for fall, as opposed to getting summer items in September, and let’s face it, I’ll probably get my Popsugar box before my CauseBox ever would have shipped despite, you know, the fact that it’s totally going to be in the first batch of boxes shipped. It’s not even the delay that upsets me. It’s the repeated promises that they won’t follow through on. I’m having flashbacks to the whole Little Lace Box disaster where the boxes kept getting “delayed” then never shipped at all. How do you get to speak to CS? Is there a number? I contacted them and they told me it would sen last Wednesday/Thursday and I would receive an email.I initially received a letter from “Brett” stating that it my box would go out in early July. I signed up in June. Very disappointed with this company so far…. I’m confused is the cause box a love hate relationship. I have been thinking of ordering but I hear good and bad things about it, not sure if your loving it or not. help should I give it a try? I ordered off Facebook. Input the Summer discount code for $10 off. I did not get any discount. When I sent in inquiry to Customer Service, they did not respond. They took the money out of my account right away. Which I guess is normal. I am on the fence. But first impression is not great. Haven’t gotten my box yet and no shipping Emails! I got mine today and I am happ with it, but I am kicking myself for not getting the year subscription so I could have received the green kimono. If anyone is looking to part with their’s I would be interested. The cream was pretty just not my colors. I just received mine. I’m really impressed with everything (and especially the kimono and, surprisingly, the nail polishes) BUT the towel (in comparison to FFF’s Trina Turk this one is like a potato bag – so thin its kind of see-through and pretty rough to the touch). I agree! The quality of the items in this box is really nice! It was my first box from causebox, and now I cannot wait for fall spoilers! I am more excited for this box than my annual with FabFitFun! Prescilla, I believe the towel is supposed to get softer the more you wash it & I find the thinner style turkish towels dry you off 500 X’s better than the thicker ones…I actually don’t care for the way the thicker ones work. Traded away my M.E. towel away & have been trading for as many of the O.P. thin pestemals as I can! Haven’t received my Causebox yet but I was hoping this one would be more like the thinner pestemals. Hope to get this box soon but really hope that the person, from the company supplying the kimonos Brett mentioned was having a family situation to deal with, is ok! This box is my most favourite box! Mine arrived yesterday and every item is gorgeous. I’ve been so pleasantly surprised by the quality of the kimono too. This one is well worth the wait! This box looks so amazing! Which is why I ordered it on 6/28 when the website said it was “Shipping Now!” which was clearly not the case. I totally understand what happened, and I feel for the artisan, but the initially, misleading information in their marketing is bothering me. Especially since email from them pushes the shipping date out further (initially 7/15-7/23,then 7/25-7/27, now I’m told it’ll ship today or tomorrow). As someone stated earlier, summer is coming to a close. Anyhow, I just wish they had done what Deck of Scarlet did with their current palette once they realized how delayed the mascara would be. Send the box without the delayed item, then send that item once it comes in, even if the additional shipping costs create a slight burden to Causebox. They discussed not wanting to “punish” the artisans for their situation, but don’t punish the subscribers as a result either. Exactly, the issue that bothers me as well is that they’ve been advertising the box consistently on Facebook, knowingly with this huge delay and I don’t know about other subscribers but I haven’t received any updates as to when my box would be shipping. I had to send them 3 Facebook messages before I got any information on my box. I got two emails about the delay. The second one stated that my box would be in the first batch of shipments and would be shipped between 7/25 and 7/27. It’s 7/31 and I have yet to receive my shipping notification. I’m a bit miffed to learn that some subscribers have already received their boxes, so they clearly lied again. I messaged them and was assured it would be shipped today or tomorrow. I’m not holding my breath. I was also told 2 weeks ago that my box would be on the first batch shipped out. Nothing against MSA, but we paid for ours, and I think paying customers come first. No communication from Causebox in 2 weeks, just a bunch of excuses on Facebook. At this point, summer is over. They should have sent what they had a month ago. Now I feel they owe customers more than excuses. We deserve an e tea item and or a significant discount off a future box. There’s NO excuse for a complete lack of communication in the past 2 weeks. Why is it that whenever i comment on this site, there’s only about a 50% chance it’ll actually show up? I attempted to post an update saying that since my box didn’t ship on Tuesday or Wednesday like they told me it would, I contacted CS again. Now I’m told that my box “is on track to expedite out” on Monday. The word “expedite” actually made me giggle. I am so sorry for the miscommunication on our end. Unfortunately, we have been waiting for a shipment of kimonos to arrive in order to finish fulfillment of/get out our next round of boxes. We truly thought that they were going to be delivered on the timeline we had, which is why we shared a concrete date with you. I am so sorry and feel terribly for that. We have started the shipping process (we are shipping out in batches as we receive the kimonos), and are on track to expedite your box out on Monday—you will receive a tracking email soon after it is out. We know this has been such a delayed shipping experience, and are so sorry for that. Of course, if you would prefer to cancel for a full refund we can take care of that for you! Ugh! I don’t know. I might just take them up on the offer to just get a refund. By now I’m just too disgusted with the horrible miscommunication, or dare I say, the disingenuous nature of their communication. I’m not even sure I’ll actually enjoy the box at this point, including that kimono I’ve been lusting after So happy I didn’t spring for the annual subscription, which I came really close to doing. . I ordered this almost a month ago and haven’t received a shipping notice. Towards the middle of the month, I emailed customer service and they said orders were going to ship between the 24-27th. Their response was fast and they did offer me a full refund, but I told them I can wait. This is a great box and I’m not impatient, but summer will be over soon . . . I received an email THREE weeks ago about a shipping delay and still nothing. Anyone else??? Mine was mailed last week and is to be delivered tomorrow. They only offered me a refund once, and told me that my box would be in the FIRST batch sent out. Obviously that wasn’t the case, and ZERO communication in the past 2 weeks. I got the email about the family issues 2 weeks ago. That doesn’t excuse not communicating or sending my box with the first batch as promised. Still waiting. Since there’s no shipping info, I’ll assume mine won’t be here until at least mid month. It’s almost fall at this point. This company majorly FAILED at handling this. I wouldnt assume everyone was offered a refund twice, because that is inaccurate. I was not. Others were not per their posts on Facebook. My email from July 17 says NOTHING about a refund, yet says I’ll be in the first batch. Some have posted that theirs was mailed last week. They have theirs now. Where’s mine? They only offered a refund ONCE to myself and several others. I had to email them myself, due to not hearing anything from them in 3 weeks, after being promised my box would be in the FIRST shipment out. They must think their customers are idiots, because they clearly stated that NOONE who did not pay for their box (influencers like MSA) was sent one yet. She claimed they value their customers. I sent them a screenshot calling them out on their lie. Apparently valuing your customers is continuing to lie to them after you screw up. Should have sent out the box without the kimono so that customers werent. punished. Since they failed to do that, they should have sent those who did not receive they boxes in the VERY first shipment a discount code and/or an extra item. There’s no excuse for lying. No excuse. Great review of the products, but the pictures of the book are a little too much. Thanks for reading, Shelli! I wasn’t sure if the necklace was my thing or not, either, but it’s been nice to wear with breezy summer dresses. If you’re heading to the beach, in particular, it’s a nice, light, carefree pick! Wait. This is definitely not the same kimono previous subscribers received, is it? At least, it’s not what I thought I was getting when I signed up. This is the kimono that was always offered with this Summer 2 box. A different one (pink) came with the spring box. I’m getting the sage one, very excited! You all are right. I looked back at the spoilers guess I just never saw the kimono fully on from the front and just looked at their artsy pics and the pics of it in packaging, so I didn’t know the way it draped in front. I assumed it was more of a traditional robe shape. My bad. Still beautiful, this style just doesn’t look good on me.